he blasted all enemies in sight. For their arrival also washed away their fears. PS: I welcome any weapon buffs in my control Hunter! Lol just got the Golden version this morning! Hope it goes well with my hunter deck! should i craft it ? I've crafted it and I love it. This is surely one of the most powerul weapons in the whole game, I suppose only Doomhammer is better. How about Blood Fury tho? 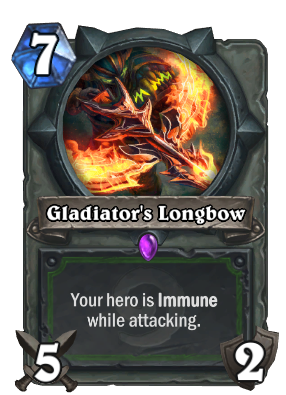 This bow has future in hunter's control oriented decks. This card is so much better than its reputation hints at. This is also the closest thing Hunters have to a heal (neutral cards aside). And the best part: It curves with Call of the Wild, for a whopping 15 damage by the end of turn 8. That's an Alexstrasza battlecry if its all used in the enemy hero. They finally fixed the explosive trap bug, I can finally play the card now. The text on this card needs to be corrected to say "Your hero is immune while attacking minions". I attacked a hunter that had an explosive trap which I knew he had but it said I was immune while attacking. IDK maybe the trap triggers after, either way that doesn't work...the trap triggered and went through my shield and killed me. HA, his actually should say immune to the minion you are attacking. I played against a paladin that had noble sacrifice and when i went to attack his taunt minion, the secret triggered, which triggered his knife juggler, hitting me for 1 damage and i died. Then his 2/1 defender went on the board since i never actually hit it. Way overcosted card and textually incorrect. Guys seriously. It's a Hunter Pyroblast for 3 less mana. It does bend to taunts tho. But still, it is pyroblast, spread over two turns and bending to taunts, for 7 mana. seems like a good bargain to me.